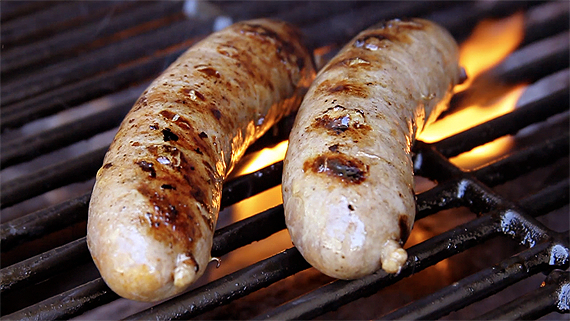 Summer is at our doorstep, so in this episode of Dude Food I’ll show you how to make sausage – specifically, beef sausage. Making sausage requires some gear, but it’s exceptionally easy to prepare. You can grill it, boil it, sauté it – however you like it prepared. It’s like a hot dog, except that it’s made with freshly ground short ribs – not lips and assholes. This is a very basic recipe so feel free to riff on it however you wish. Music by Speaking The Kings. Check out the band on Facebook, SoundCloud, and YouTube. Light up the grill!!! Good vid dude…If only I could afford a kitchen aid…Maybe one day. I’ll just have to get a manual one. You have mad skills there. Homemade sausage is hands down so much better than mass-produced.